The holiday gift-giving season is just around the corner. 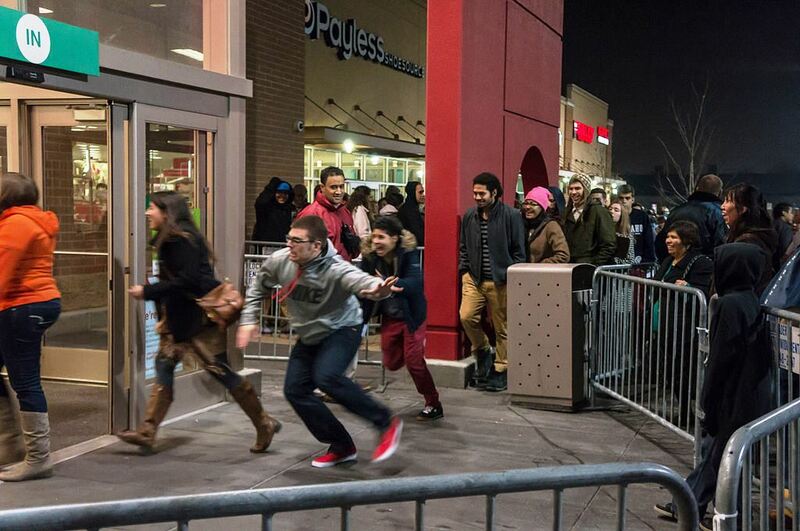 Black Friday is 42 days away and Christmas Day follows 30 days later. Luxury new arrivals have started to make their way at World of Watches and there’s no better time than right now to check out these outstanding new styles, perfect for holiday gifts. Whether you’re looking for a gift for someone special or are considering treating yourself, there are over 160 new men’s and women’s watch styles from the very best names in luxury to select from at World of Watches, including highly sought-after models from Rolex, TAG Heuer, Tudor, Movado, Tissot, Maurice Lacroix, Oris, Alpina, Frederique Constant, Gucci, Longines and Raymond Weil. The Tudor Monarch Men’s Watch in premium grade stainless steel and 18K yellow gold is made expressly for the most discerning of men. This impeccably crafted Swiss-made men’s timepiece features the contoured round case in premium grade stainless steel in a highly polished finish. The handsome brushed stainless steel multi-link bracelet is accented with polished 18K yellow gold center links. The fluted 18K yellow gold crown adds to the striking good looks. The perfectly round 18K yellow gold bezel with raised fluted detail surrounds the metallic gold colored dial with luminous baton hands and raised baton hour markers. A window at the 3 o’clock hour reveals the automatic date calendar. Premium Swiss-made quartz movement inside assures you of precise time-keeping accuracy. Features include a scratch resistant sapphire crystal above the dial and water-resistance to 100 meters or 330 feet. 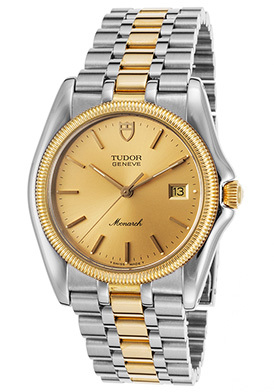 Tudor Monarch Men’s Watch is 37mm in diameter and 8mm thick. Women’s diamond watches are popular holiday gifts and the Eterna Grace Diamond Automatic dress watch is a sensational gift choice. This breathtaking Swiss-made timepiece features a shimmering array of brilliant round-cut diamonds pave-set to perfection on crescent, swirl design bezel. The perfectly round case in premium grade stainless steel is highly polished to a mirror-bright patina. The two-tone bracelet in polished stainless steel and rose gold-tone stainless steel adds to the sophisticated appeal. The iridescent Mother-of-Pearl dial features polished rose gold tone luminous hands and inlaid diamonds in a dramatic swirl pattern surrounding the open heart window at the 12 o’clock hour. An exhibition skeleton case back lets you view the intricate automatic movement inside. Features include a scratch resistant sapphire crystal above the dial and water-resistance to 50 meters or 165 feet. 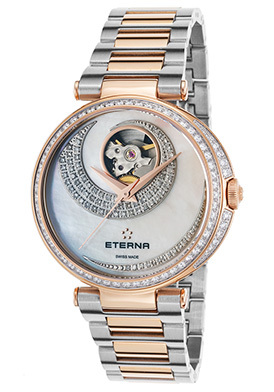 Eterna Grace Diamond Automatic women’s dress watch is 34mm in diameter and 10mm thick. TAG Heuer are perennial holiday favorites and TAG Heuer Link Series men’s chronograph and Alter Ego women’s watch are excellent choices. Unmistakably rugged and masculine, the TAG Heuer Link Series Chronograph for men makes a bold statement on the wrist with an amply proportioned round case in brushed stainless steel. The signature link bracelet in brushed stainless steel adds to the robust design. 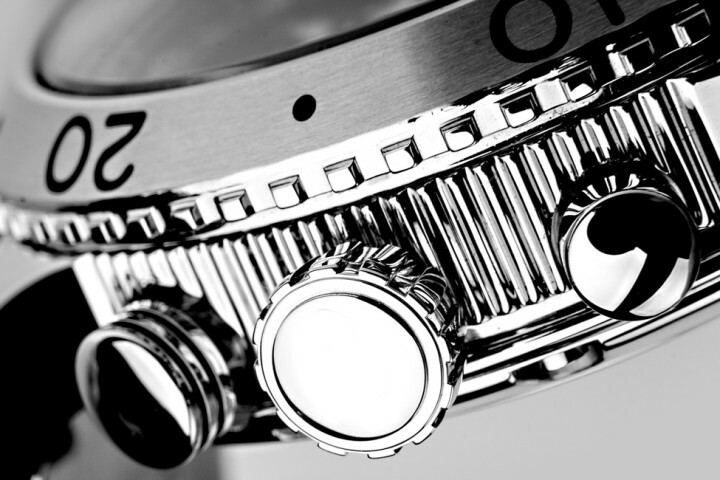 The handsome unidirectional rotating bezel in stainless steel has a coin-edge rim and engraved markers. The silver colored dial shines with three sub-dials, silver colored luminous hands and baton hour markers. Features include a date window at the 4 o’clock hour, 1/10th of a second, small-second and 12-hour countdown timers. A glare-proof scratch resistant sapphire crystal covers the dial. Premium Swiss-made quartz movement inside assures you of precise time-keeping accuracy. 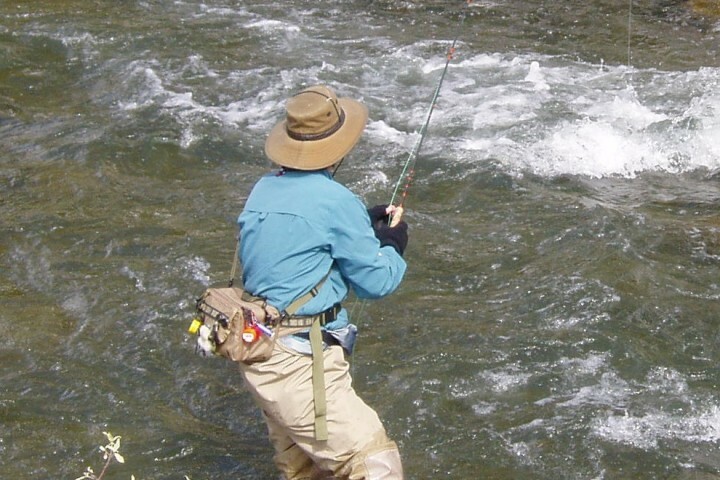 A locking screw-down crown and case back provide water-resistance to 200 meters or 660 feet. 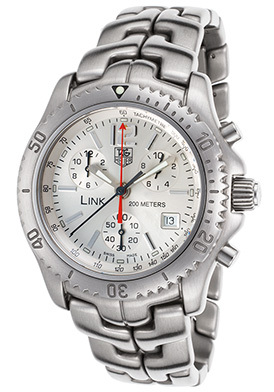 TAG Heuer Link Series men’s chronograph is 42mm in diameter and 13mm thick. 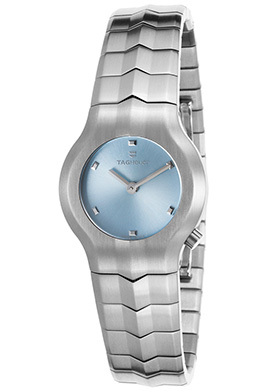 Unmistakably feminine the TAG Heuer Alter Ego women’s watch is chic, graceful and alluring. The round contoured case and integrated horizontal link bracelet with a raised center ridge create one flowing line of luxury in premium grade stainless steel with a satiny brushed finish. The fully integrated bezel surrounds the metallic blue dial with silver tone hands and hour markers. Features include premium Swiss-made quartz movement inside, a scratch resistant sapphire crystal above the dial and water-resistance to 100 meters or 330 feet. 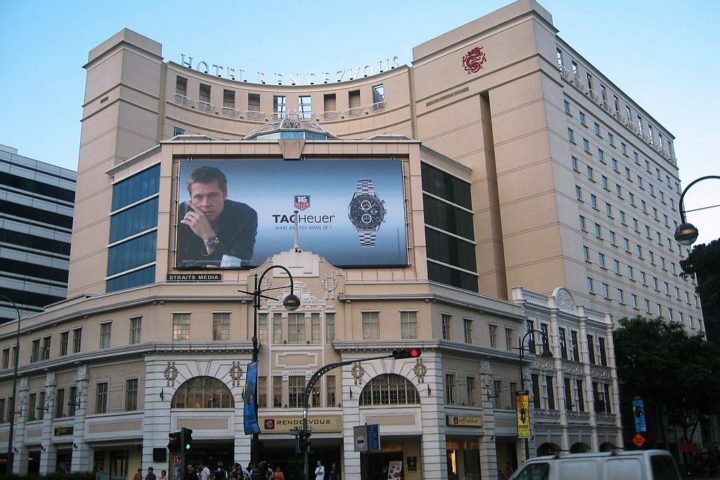 TAG Heuer Alter Ego women’s watch is 25mm in diameter and 7mm thick. The Movado Bold Sport Edge watch is a modern and dynamic choice for today’s man. The perfectly round case in brushed premium grade stainless steel is presented on high-performance black rubber strap with the signature Movado concave dot embossed on the center panel. The black rubber covered bezel with a coin-edge rim surrounds the attractive patterned black dial with luminous sword hands and orange baton hour markers. A window at the 3 o’clock hour reveals the automatic date calendar. Features include premium Swiss-made quartz movement inside, a scratch resistant sapphire crystal above the dial and water-resistance to 30 meters or 100 feet. 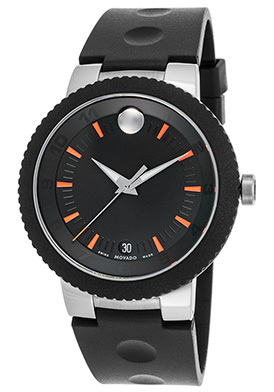 Movado Bold Sport Edge men’s watch is 43mm in diameter and 11mm thick. You don’t have to look any further than the Tissot PRC 200 Chronograph for a sleek and sporty women’s watch. 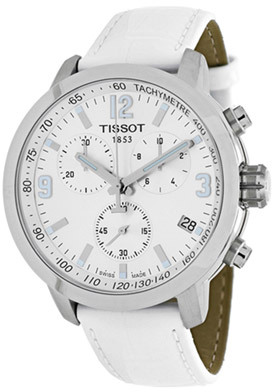 The generously oversized stainless steel case is presented on an attractive white leather strap. The integrated bezel surrounds the white dial with a date window at the 4 o’clock hour, a tachymeter outer dial, 1/10th of a second, small-second, 30-minute sub-dials, polished silver-tone baton hands, Arabic numeral and baton hour markers. Features include premium Swiss-made quartz movement inside, a scratch resistant sapphire crystal above the dial and water-resistance to 100 meters or 330 feet. Tissot PRC 200 women’s chronograph is 42mm in diameter and 13mm thick.